Wynonna will become one of our foundation cows. She measured 55.00 TTT on 04/19/2018 and projects to 84.1” TTT at maturity. She classic light brindle and white coloring and great horn growth. 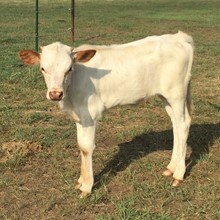 Wynonna was confirmed bred to Dunn Esquire (FHR is always happy with and seeking Nancy Dunn genetics) and they gave us a pretty little heifer named FHR Awesome Nona. Follow up breeding will be an AI from Hubbells 20 Gauge and again can’t wait to see the progeny from that combination.